Cacao fermentation induces biochemical changes in the beans that lead to different cacao grades such as slaty (unfermented), violet (under fermented) and brown (fully fermented) beans. This grade heterogeneity in a sample set can impact the quality of the end-products. In the present study, amino acids and polyphenol contents of slaty, violet and brown beans were evaluated. Free amino acids were derivatized from o–phthalaldehyde and detected with a fluorescence spectrophotometer coupled with a reverse phase HPLC system. Polyphenols were analysed at 280 nm by HPLC using a Photodiode Array Detector. 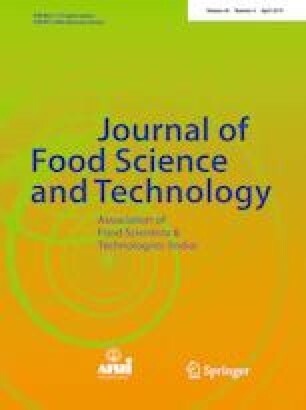 Amino acids content in the violet beans were significantly higher (11,165 ± 4281 mg kg−1 fat free dry material, ffdm) than that of the slaty beans (4304.5 ± 1927.6 mg kg−1 ffdm), meanwhile there was no significant difference between violet and brown beans. Epicatechin, catechin, cyanidin-3-arabinoside and cyanidin-3-galactoside contents were significantly lower in violet and brown beans when compared to slaty beans. Our results have shown that a mixture of violet and brown beans is suitable to obtain polyphenols and amino acids in the development of cacao products. The online version of this article ( https://doi.org/10.1007/s13197-019-03749-y) contains supplementary material, which is available to authorized users. N. Niemenak acknowledges financial support from Humboldt foundation (www.humboldt-foundation.de).